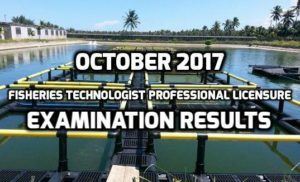 The recently concluded October 2017 Fisheries Technologist Professional Licensure Examination already has the results from the Professional Regulation Commission (PRC) and released on November 6, 2017. As detailed by the commission, the board exam took place last October 25-26 and from the 1,399 applicants, only 479 of them passed the licensure. The PRC’s Board of Fisheries administered the scheduled examinations headed by its chair Westly R. Rosario and assisted by board member Catalino R. Dela Cruz. The designated test centers include Baguio City, Cagayan de Oro City, Cebu City, Davao City, Iloilo City, Legazpi City, Lucena City, Manila, Tacloban City, Tuguegarao City and in Zamboanga City. The commission was able to release the names of the passing examinees after five days of the final scheduled board exam.